ADDICTS COMEDY TOUR 'Trudging the Happy Road'$20 Regular Seating$35 Preferred Seating includes a post show meet and greet with part of the proceeds going to a local recovery group. Humor heals all wounds...eventually. Enjoy the deep laughs emanating from surviving life's darkest moments in this funny, poignant comedy show about the journey back to sanity. 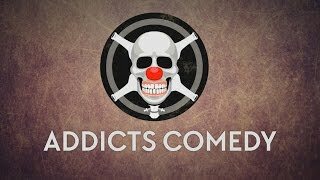 The Addicts' Comedy Tour is a new stand-up show about overcoming life challenges with laughter and strength. Drawing upon their shared friendship and experiences around often persistent addictions, nationally headlining and most in-demand recovery comedians Mark Lundholm and Kurtis Matthews finally tour together to share colorful stories about life, love, jail and rehab, and keep you laughing along the way. With over 50 years of recovery between them, these seasoned performers have a lot to share and laugh about. Don't miss this amazing show!Mark Lundholm has performed in all 50 states and 10 foreign countries. From world-renowned musicians, heads of state, Fortune 500 companies to rehabilitation centers and convicted felons, Mark has truly entertained on the world's stage. He's appeared on Comedy Central, Showtime, A&E, CBS, and NBC. Mark wrote and performed his own one-man show off-Broadway in New York City reaching critical acclaim, and in his spare time created the now staple DVD series, Humor in Treatment and the Recovery Board Game. One thing is clear about Mark Lundholm - he's not slowing down anytime soon. With a brand-new DVD series called Family in Treatment out, a soon-to-be-finished book and a television series in development, there are plenty more laughs coming from this revolutionary entertainer! Kurtis Matthews has toured nationally and internationally since 1984. He starred in the BBCs 'Find me the Funny' and has appeared on VH1 'Celebrity Rehab' and A and E. Currently, he performs in multiple NA, AA conventions, Rehabs and private fundraisers every year. In 1999, he founded the San Francisco Comedy College (SFCC), which has become the largest stand-up school in America. Over the past fifteen years, the SFCC has cultivated new comedians who have revitalized the local comedy market and have won a majority of comedy competitions in the Bay Area. @addictscomedy (twitter)www.addictscomedy.com$20 Regular Seating$35 Preferred Seating includes a post show meet and greet with part of the proceeds going to a local recovery group.